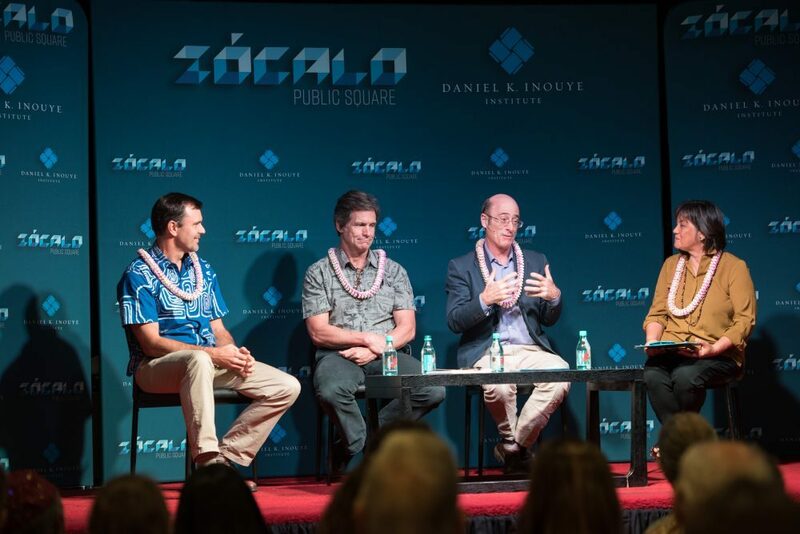 A panel of experts gathered at Artistry Honolulu to take their best shot at the urgent question “What Can Hawai‘i Teach the World About Climate Change?” The Zócalo/Daniel K. Inouye Institute “Pau Hana” event brought together Chip Fletcher, a University of Hawai‘i at Mānoa geologist; Robert Lempert, a RAND Corporation scientist and contributor to the Nobel Peace Prize-winning United Nations’ Intergovernmental Panel on Climate Change; and Joshua Stanbro, chief resilience officer for the City and County of Honolulu. Despite the recent torrent of grim United Nations reports, and terrifying TV footage of Florida beach homes being blown to smithereens, the evening’s tone was relatively upbeat. While nationalistic leaders bellow about withdrawing from international climate accords, states like Hawai‘i and California are aggressively pursuing their own environmental paths, and the panelists suggested that significant work is being done at the state and local level to keep Earth from turning into a giant Sahara. 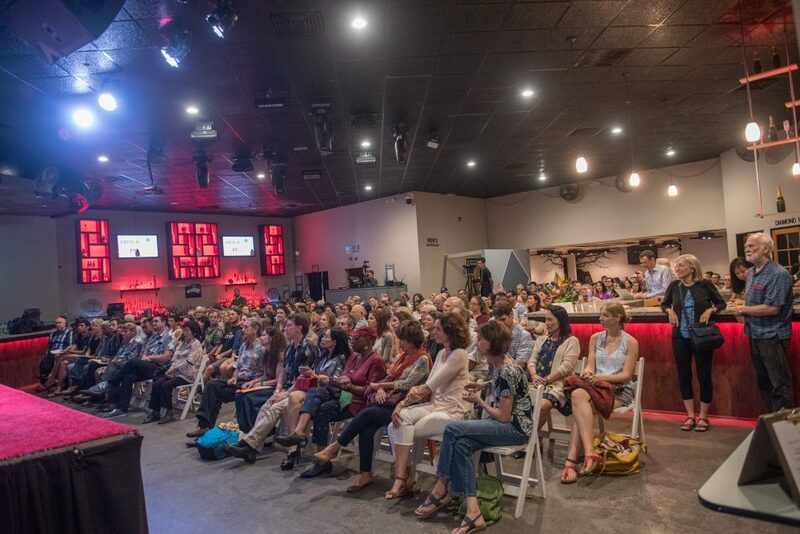 Much of the discussion, which took place before an overflow crowd, focused on how the most remote of U.S. states (as well as one of the smallest) could become a climate-change laboratory and set an example for others to follow. Moderator Catherine Cruz, host of Hawai‘i Public Radio’s “The Conversation,” dived straight into the question of how Hawai‘i—which lately has been battered by torrential rains, volcanic eruptions, and other torments—can bring its citizens together around climate-related issues. 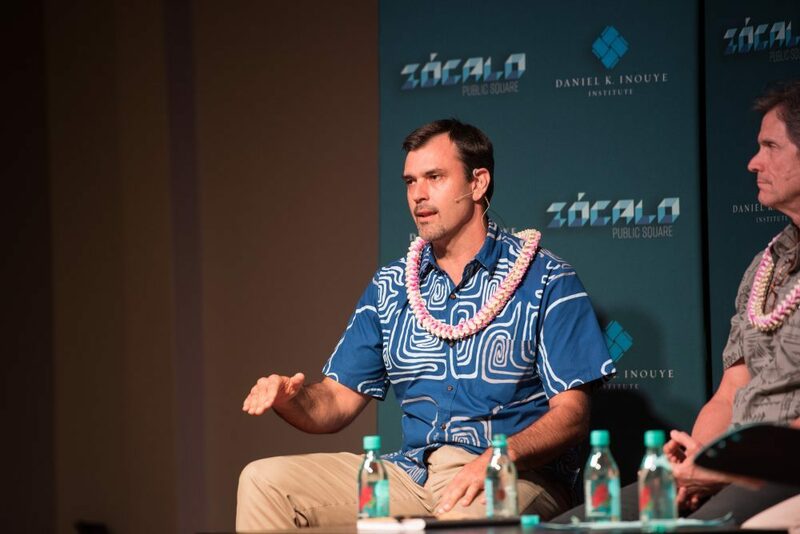 Stanbro, the Honolulu official, acknowledged that even experts sometimes are unsure how to size up the risks to the planet—and figure out how best to respond. “We don’t know how this is going to shake out, so we’re sort of inventing it in real time,” he said. 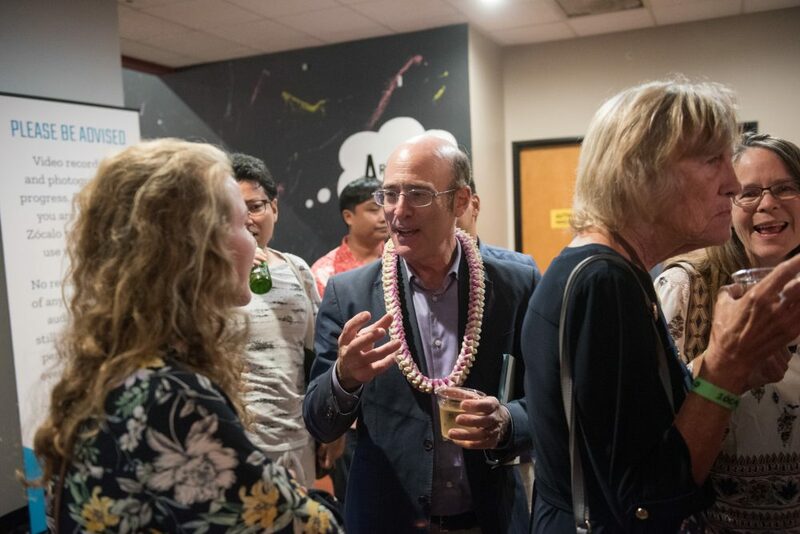 That’s one reason, Stanbro explained, why Honolulu city and county are holding a series of nine meetings around the island of Oahu, to get a sense of what various communities are doing to address specific local problems, set priorities, and develop action plans. Stanbro said that many cities and counties have stepped up their responses to global warming, now that bond agencies are including climate change as a risk factor in evaluating municipal credit ratings. If a municipality doesn’t have a good plan for mitigating these threats, a bond agency may give it a lower credit rating, making it more expensive for the municipality to get credit and take on debt. Lempert, the RAND expert in climate management and adaptation, said he has studied communities around the country that are making climate-change response a critical part of their planning. Stage one of this process, Lempert said, is simply for communities to notice and acknowledge that climate change is happening. Step two is making a risk assessment. Step three is coming up with an action plan to reduce the municipality’s carbon footprint. “We’re just starting to see people moving into it, and there’s a lot going on,” he said, citing communities that are developing new guidelines for bridges, roads, and other infrastructure that now have to take climate change impacts into account. Fletcher, the geologist, said he recently co-authored an op-ed in a local newspaper about sea-level rise, which could reach one meter (about three feet) by the end of this century. Hawai‘i is very susceptible to this menace, particularly during the summer, and high-tide flooding could prove catastrophic before mid-century, if present carbon emission rates persist. Rather than stick their heads in the sand, communities need to start adapting to these changes, Fletcher said, and some are doing just that. He has proposed that if a community is going to invest in long-term expensive infrastructure, like a coastal power plant, it needs to anticipate as much as a six-foot sea level rise because it’s unclear how fast the Antarctic ice shelf will melt. Fletcher also said that improved climate-change modeling also can offer better predictions on how (for example) erosion caused by rising seas will affect Oahu’s north and south shores in different ways. Such an increase could swamp parts of Hawai‘i, whose seas already have risen 3.5 inches since 1960, according to some calculations. And with world temperatures currently heading for 3.5-degree centigrade increase by the end of the century, much will hinge on what happens in places considerably bigger and more densely populated than the Aloha State. There’s a growing demand for new energy, and about half of this is coming from India and China, whose populations are eager to enter the global middle class. What’s really needed, the panelists concurred, is “a war on carbon.” The developed world needs to be helping poorer countries buffer themselves against the worst effects of a warming atmosphere while slashing overall carbon emissions by about 50 percent per decade, if global warming is to be limited to no more than 2 degrees by mid-century. That scenario, the panelists conceded, would be a huge stretch. But Hawai‘i, which has vowed to be virtually carbon-free within three decades, already may have helped sway California Governor Jerry Brown to make the same pledge, Stanbro suggested. Hawai‘i also can learn from other communities. Fletcher said he recently did some research on how flood-threatened Miami has invested a small fortune to build 80 pump stations which will take rain runoff and other water, spin out some its contaminants, and recycle it into Biscayne Bay. The city is studying how to sacrifice the first and second floors of buildings to allow water to move back and forth through these structures, and also how to raise many of its most vulnerable roads. A third audience member asked how to ensure that we don’t put the costs of environmental sustainability on the poor and on indigenous communities. Stanbro said that such groups already have borne a disproportionate share of climate-change impacts. “We’ve got to figure out how we put equity into this,” he said.